Jose Manuel Ramos-Horta, former President of Timor Leste, announced that in his capacity as Nobel Peace Prize he nominated this year the Cuban Henry Reeve medical contingent to such high recognition. No institution or group deserve more this distinction that those doctors, nurses and technicians, for their outstanding contributions to many countries around the world, said Ramos-Horta during his speech at the X International Congress University 2016. He said that when it comes to innovative education, to serve the people and the whole society, we must mention the Cuban doctors. 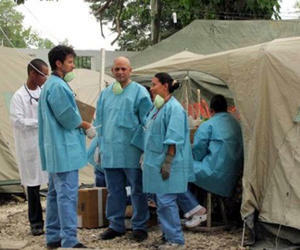 Cuba has a lot of physicians around the world, while economic powers use their resources for other purposes, and is not that everyone has medical, but also agricultural brigades, or other sectors, he said. In 2015 the Henry Reeve Contingent was proposed to the Nobel Peace Prize for its work to face disasters and epidemics, but the award was given to the Quartet for the Tunisian National Dialogue.